So now it’s really the most wonderful time of the year! My 2018 holiday baking list is HERE! Let me tell you a funny story. Last Christmas (I gave you my heart…), I ended up sick ON Christmas. Some sort of stomach flu or something – and it was so bad that I missed Christmas Eve and Day festivities. All four of us did, because Emilia was only a month old and we were afraid of Eddie and Max spreading the germs in case they had the bug. I was super sad to miss those special days that are so memorable and nostalgic for my family. And I made a list in my phone in the notes section, titled “CHRISTMAS 2018!” with things I didn’t want to miss and things I wanted to make sure we did this year. I baked a LOT last year. It was so easy! Emilia was in that sleepy newborn stage and Max loved to help me. We baked so much so we could make our big famous cookie trays for everyone. Then… we didn’t go anywhere on the 24th and 25th, which are the days when most of the cookies get eaten. Um. We had a LOT of leftover cookies. I took them all to my mom who then proceeded to eat them over a three month period. It was ridic. But my list is still really long for baking this year! I might make everything below, but maybe just one batch of each, for sure. I have a few delish cookie recipes coming for you in the next few weeks! They are tried and true favorites that we’ve been eating for years, so you will love them. And of course, I’m including my favorites below! Pro tip! Some of these adorable little cookies are ones I picked up at DeLallo’s one day. When we make our big trays, it’s awesome to grab some little ones to fit in the cookie crevices. I also have a SUPER FUN holiday baking playlist for you! Also! For two years running, Lacy and I have made a Buche de Noel and loved it so much. We are planning on doing it again! We usually spend one day together and will make that, along with Tracy’s citrus peels, her homemade amaretto (we’ve made both of those for YEARS!) and then whiskey pretzels or something of the sort. Oh and P.S. I make a bunch of the doughs on one day and refrigerate them, and then bake when I can over the next two days or so. Totally works out! these salted dark chocolate chunk cookies because they are DELISH. peanut butter blossoms. definitely my all time favorite and a cookie I just can’t get enough of. perfect cut out sugar cookies. these are the BEST foolproof, simple sugar cookies. the only recipe i use! my soft snickerdoodles and these chewy chai snickerdoodles. I can’t ever choose between them! soft gingersnaps. sometimes I make this recipe x four. We LOVE them. And I’m not a gingersnap person! definitely these old school oreo balls, and chocolate coconut truffles, and buckeyes! mother lovett’s pink and green thumbprints. because can’t have christmas without them – my mom and aunt’s faves. annnnd mother lovett’s orange cookies. huge hit all the time. definitely a bunch of peppermint pattie brownies. and some peanut butter stuffed chocolate pretzel bark! I will probably also make some peppermint bark. And I love to do chocolate covered oreos! They are so easy. I also buy the white fudge covered oreos as a hack and drizzle them with dark chocolate and sprinkles! lemon crinkle cookies! I made these for the first time last year and I’m sharing it here shortly. salted pistachio chocolate shortbread. I first made this spin on Alison Roman’s famous chocolate chip shortbread last year. I’m sharing my version this year! cashew butter buckeyes. These are INSANE. They might rival the peanut butter ones. Recipe is yours soon! the chocolate crinkle sprinkle cookies in The Pretty Dish. They are always a HUGE hit! the autumn monster cookies in The Pretty Dish. Favorites!! peanut butter fudge. I google a recipe and use a different one every year, even though Mother Lovett had one. Now tell me tell me! Let me know what is on your list this year. 2018 Holiday Gift Guide: Babies & Toddlers. I totally aspire to make Christmas cookie boxes but I know with a 5 month old at Christmas time I won’t be able to do this much. Do you have a general schedule that you follow? Do you scale down recipes? Any other hacks like buying the fudge covered oreos and dressing them up? This new mama would love some help! I’m heading to Trader Joe’s today and hopefully can find some stuff there to round out the boxes! Not a cookie but I think the TJs chocolate almonds that are dusted with sugar and salt would be AMAZING as gap filer or even put in a cute cupcake liner to take up some space in the boxes. Thanks for the suggestion! They have really cute dark chocolate star shortbread cookies that look festive and like perfect filler as well! yesss the Trader Joe’s options are incredible! fabulous idea. hilary the way i do this with having little kids is that i make the doughs all ahead of time (so this might be 2 days, like make a few doughs during nap time for 2 days) and then do the same with baking – bake them all on one or two days. the key is to be organized and all set up. ready to go when baking. so have a few cookie sheets, parchment, some clean space (counter or table) to transfer cookies after baking, and containers or boxes ready for packing them up! honestly i also tend to find myself doing this at midnight to finish up when the kids are asleep! Try the Nutella cherry hazelnut fudge from everydayannie.com – it is so easy and will blow your mind! Every year for ages we’ve had a massive sugar cookie baking day with my parents, dating back to when I was a kid. My daughter is 8 now and loves to help and it’s all I can do not to just sappy-cry all day because I love it so much. i love that!! sounds so fun! 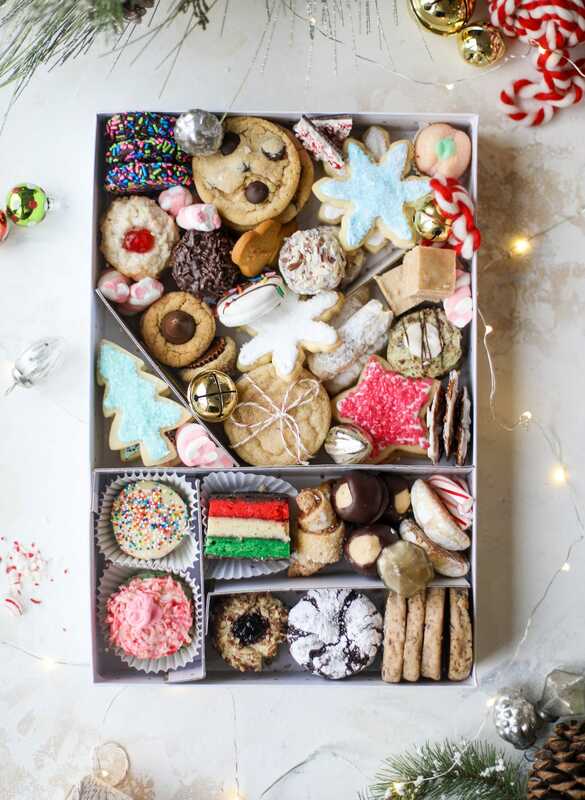 Going to be baking ALL of the cookies and most of your receiopies about this year and I’m searching for cute cookie boxes like the ones about in your photos. Where did you find those?! i use the sugar paper boxes from target! they are so sturdy. just cut out pieces to put inside as dividers! How far in advance do you make them that they still stay fresh to gift? i usually make them starting the second or third week of december! We’ll definitely be making oreo balls! I got the idea from you last year and they were such a hit with my stepsons that we made them for every party we had this year. Other must bakes: eggnog fudge, peppermint pattie brownies (my stepsons call these Minecraft brownies), and cutouts. I make the eggnog fudge the first week of December and then start baking here and there about a week and a half before Christmas so that I’m not doing too much at any one time. i think i need the eggnog fudge! recipe? I love Buckeyes so much and last year I made them with a Gingerbread peanut butter from Wild Friends. OMG, just heaven. We are a Gingerbread family and our cutouts are the same. Just Christmas to me. You can make many doughs and freeze them in a blob OR even roll them in balls and freeze the balls. Bar cookies/brownies you probably need to bake and freeze those, cut or uncut. I learned this when I had to make literally 1000000 cookies for school and I work full time. With all that frozen dough, I could bake all the cookies in less than 2 hours. YES!!! totally agree. making all the doughs in one day and then the cookies the other are is the best way to do it. especially if you have a great assembly line set up for baking that day! Jessica, these boxes are stunning! So inspiring! haha no. i just make them and give them to friends/fam! i love that ladonne! thank you so much. My mom and I usually make so many each year so she can give out cookie trays too. The last couple years we haven’t done as much, but I’m hoping to bring it back this year! Buckeyes, snowballs, peanut butter blossoms, iced sugar cookies, gooey butter cookies, pizzelles. And I want to try out a few new ones from The Cookie Book! what are gooey butter cookies? i ned those! 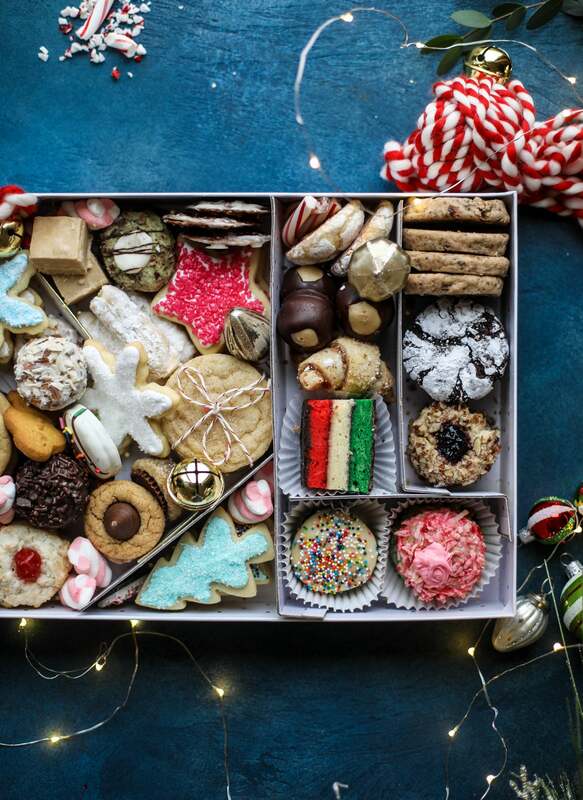 Special request: where can I find cookie boxes like yours with dividers? Many many thanks! thanks! i buy the sugar paper boxes from target and make the boxes myself! Thanks! Starting next week I bake for 3 different charity cookie trays so nice to have something different. i love that! so kind! Can you just mail me the box of cookies above? I think I will make Christmas crack and some bark made with graham crackers oh and sugar cookues..
ohhh christmas crack. i always forget about that! 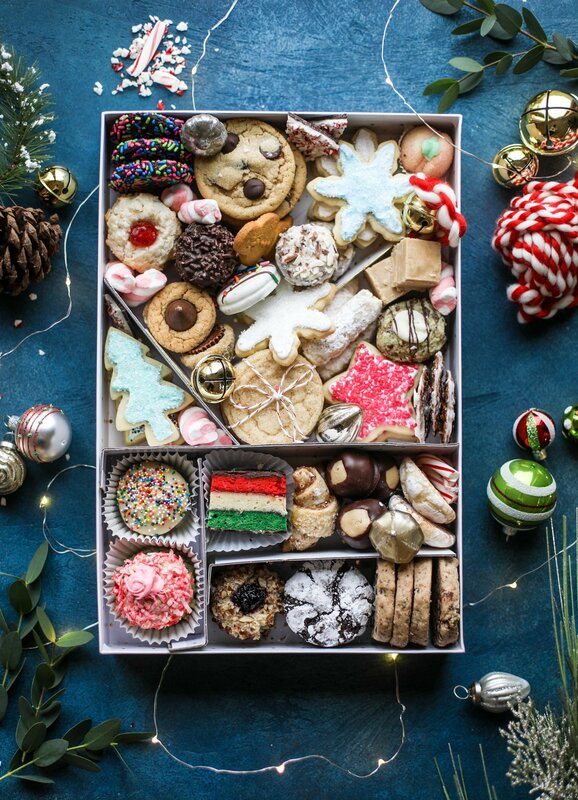 This cookie box looks SO pretty!! I love Christmas baking – it is my favorite! I like baking the cookies almost more than eating them! thank you so much ashlyn!! so do i. after all that baking i don’t really have a desire to eat them, haha. i just like to give them away! Thanks for the link to the sugar cookies! I just ma de a batch and they were so easy and came out perfectly delicious! aren’t they the BEST sugar cookies? i love them! I have been baking Christmas cookies since the second grade each year more and more and better and better . I now have a huge book of favorites and it is so hard to choose what to make dates pin wheels molasses cookies Buckeyes Belgian waffle cookies to name a few. There are twenty kinds in my freeze and counting . Glad to see others love this time honored tradition! Keep baking and smiling and make your friends and family happy. Best of the season to all! Thank you for this! I will definitely be making a lot of these. Happy holiday season! Weird question here…did you make the box the cookies are in? i just cut pieces to make dividers in the box! these are the best ones i’ve found to make structured boxes. Hi! Can you tell me what cookies are the ones pictured, chocolate rounds with sprinkles? Thanks! hi nancy! those are the chocolate sprinkle cookies from The Pretty Dish! “post-it” some recipes today. I’m on a time frame I’m having shoulder surgery the 19th of Dec. on my dominant arm too. wawwww! Nanaimo bars: made so many batches of these I could do them in my sleep! Rum balls: with lots of rum. But I need to hide these from myself! I usually bake 6-7 different cookies each year over one weekend to pack into give-away cookie tins (yayyyy, dollar store finds!! ), but I’m taking a break this year from tradition. Instead, I’m holding a cookie swap party with some friends right before Christmas! I’m attending another swap earlier in the month, and I’ll be making chocolate-dipped peppermint swirl cookies with crushed peppermint candies sprinkled on top! So excited for those. Not sure what cookies I’ll make for my own cookie exchange, but my grandmother’s chocolate pecan snowballs are a contender. So are my great aunt’s vanilla oatmeal cookies. Decisions are hard!! I usually do ginger, sugar and shortbread cookies, plus some kind of chocolately bar or ball. But gooey butter cookies (check lottie and doof for a recipe!!) are my must bake every single year. They are THE BEST cookie I have ever eaten. I get invited to potlucks from departments I used to be a part of at work in hopes I will show up with these cookies. Oreo balls! I LOVE THEM and they’re so easy, but for some reason we only make them at Christmas!! They are certainly on my Christmas baking list! I’m going to add some of your recipes, and I’m dying to try your chocolate sprinkle cookies! YUM! Thanks for this awesome list! How long will cookies keep? I am having a dinner party on the 15th and a work party on the 20th and I want to make a large variety like this!! Do you ever freeze your dough? I always make peppermint puffs (soft peppermint cookie with crunchy outside as it’s rolled in egg white and sugar before baking) – I’ve made them every year since I was a little girl! Cardamom snowdrops (like Russian tea cakes but with cardamom added for a warm, wintery spice!) I always make some sort of peanut butter situation. Usually peanut blossoms but thinking Buckeyes this year… let’s be honest, probably both! Then I think I’m adding the autumn monster cookies this year and some eggnog fudge that another commenter mentioned sounds good. Need a recipe! Thanks for the inspiration!!!!!! also, will try these cookie recipes. Hope you are not sick this year! Your baking Mother Lovett’s cookies at Christmas made my holiday in 2011 when I first discovered Food Blogs. And How Sweet. I had so much fun. We had a persimmon tree and went nuts with fruit. I found a good recipe somewhere. And white chocolate cranberry walnut cookies – my niece Shauna gave me that recipe. The other thing I can’t get enough of is Heidi Swanson’s 101 Cookbooks Roasted Pumpkin spiced pie. Coconut milk! You always get me excited about the holidays. My sister and I have been making your chai snickerdoodles for the past few years, we love them and love that it has become part of our Christmas tradition. They all look so amazing! What is the layered coloured cookie? I need a couple more to add to my list (so far speculaas, gingerbread, choc crinkles and shortbread bites). Im thinking something peanut butter, maybe easy dipped oreos and then something colourful!! This doesn’t need to be posted. It’s rather sad that out of 55 Christmas songs listed only one, Little Drummer Boy, is about the reason Christians celebrate the holiday – it’s the Mass of Christ. Can you imagine the outcry if this was done to any holiday having to do with Mohammed. The secular songs about Christmas are loved and appreciated, but so too are the religious hymns, like O Holy Night. So, I watch pastors like Joseph Prince, of Singapore, and Steven Furtick of Elevation, anyone from Bethel Church in Redding CA, and Travis Greene from Forward City Church, N. C. He’s also an amazing artist that you can see in Do It Again w/Elevation Worship. Not to be missed is the song Naitula by Hope Trollip. It’s stunning what’s happening in Zambia. what “doesn’t need to be posted?” a joyful playlist that is meant for baking cookies with your friends and fam on a christmas afternoon? Do you double any of your recipes or so you find a single batch is enough with the amount of recipes you make? I’m always trying to figure out how much I really need of each and can never decide whether I should be making more. Thanks! That cookie box is goals, for sure. I really want to make rainbow cookies this year. Is there a recipe on the blog? Have you ever rolled your peanut butter blossoms in Turbinado/Sugar in the Raw? It takes it to the next level. Would you do a post on how you make your box inserts? Do you have the reciepe for the pink coconut cookies with the little dolip of pink frosting? I didn’t see it posted on your site. It is the good quality content.